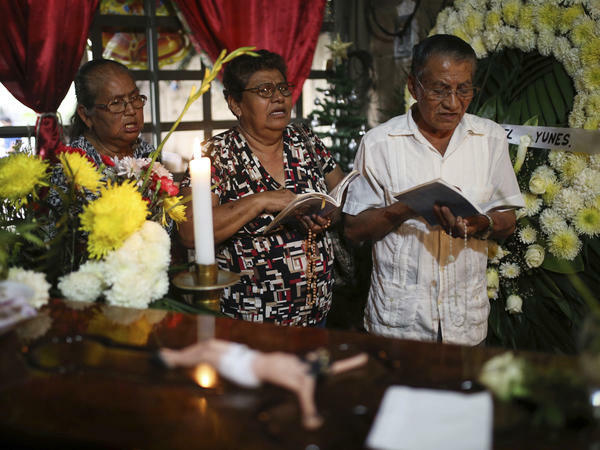 People pray next to the coffin of slain journalist Gumaro Pérez Aguilando during his wake at his mother's home in Acayucan, Veracruz state, Mexico, on Wednesday. A new report by the Committee to Protect Journalists says that at least 42 journalists worldwide were killed in 2017 in retaliation for their work — which marks a drop from the 48 killed last year. But one country defied what appears to be a downward trend — Mexico. Outside of conflict zones, Mexico takes the No. 1 spot for journalists murdered in 2017. The CPJ is investigating 20 other killings possibly related to journalists' work but so far no connections have been made. "The rise in the number of journalists murdered in Mexico in retaliation for their work is terrible news and suggests that the Mexican government has failed in its public commitments to end the culture of impunity," says Joel Simon, the executive director of the Committee for the Protection of Journalists. Mexican officials say they are working to stop the murders. They point to a federal protection program for media workers that provides bodyguards and even "panic buttons" to summon police in case of danger. But journalists enrolled in the program say it doesn't work and is inadequate for the threat they face. Organized crime gangs and corrupt officials offended by reporters' coverage are believed to be behind the killings. With few cases resolved, it is difficult to say for sure who is behind the murders. The Paris-based Reporters Without Borders says the number of reporters killed in Mexico is higher, putting the figure at 11 this year. Local press freedom groups put the number even beyond that. Each group has different criteria to determine whether a media worker was killed in retaliation for his or her profession. Many reporters in Mexico have been forced out of the profession or have opted to self-censor. Many more vow to fight on despite the threats. Most at risk are reporters working for small outlets, far from Mexico City. That was not the case, however, in the murder of Miroslava Breach, who covered crime and corruption as a correspondent for the national newspaper La Jornada in the northern state of Chihuahua. Breach was killed on March 23. Gunmen shot her in her car as she pulled out of her driveway, with one of her three children sitting next to her. At the time, reporter Javier Valdez, one of Mexico's most acclaimed chroniclers of the country's drug war, defiantly wrote about Breach's killers. "Let them kill us all, if that is the death penalty for reporting this hell, No to silence," he wrote. Less than two months later, Valdez was pulled from his car and murdered in the street just blocks from the offices of his newspaper Riodoce in Culiacán, Sinaloa. No one has been charged in the case of either Breach or Valdez.